Have you ever thought about life design? What I mean by this, is to design your life so that it matches — you guessed it, YOU. It makes a lot of sense, and yet, so many of us are living our lives based on other people’s expectations, what we thought we were supposed to do, and are conforming to social norms. It breaks my heart to see so many people feeling stuck and not knowing what to do to change their lives. After all, the essence of happiness is to feel confident and free to be exactly who we are. 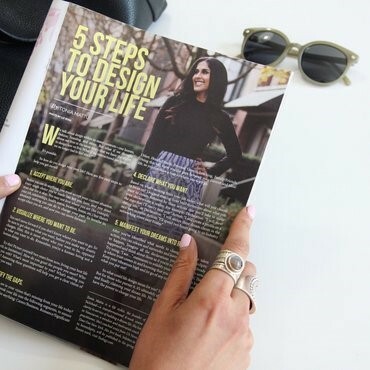 That’s why I put together 5 steps to Design your Life in an article that was recently published in Fresh Magazine, and I’m excited to share them with you today. 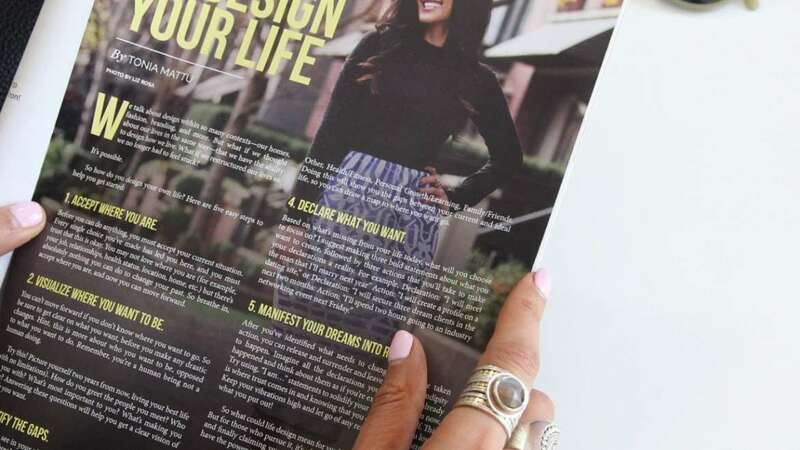 Check out the article below and let’s get you started on designing your life! We talk about design within so many contexts – our homes, fashion, branding and more. But what if we thought about our lives in the same way – that we have the ability to design how we live. What if we restructured our lives so we no longer had to feel stuck? Accept where you are. Before you can do anything, you must accept your current situation. Every single choice you’ve made has led you here, and you must trust that this is okay. You may not love where you are (for example, your job, relationships, health status, location, home etc.) but there’s absolutely nothing you can do to change your past. So breathe in, accept where you are, and now you can move forward. Visualize where you want to be. You can’t move forward if you don’t know where you want to go. So be sure to get clear on what you want, before you make any drastic changes. Hint, this is more about who you want to be, opposed to what you want to do. Remember, you’re a human being not a human doing. Try this! Picture yourself two years from now, living your best life (with no limitations). How do you greet the people you meet? Who are you with? What’s most important to you? What’s making you smile? Answering these questions will help you get a clear vision of the life you want. Identify the gaps. What did you see in your vision that’s missing from your life today? It may help to break your life into the following segments, to ensure that you don’t miss anything: Career/Business, Romance/Significant Other, Health/Fitness, Personal Growth/Learning, Family/Friends. 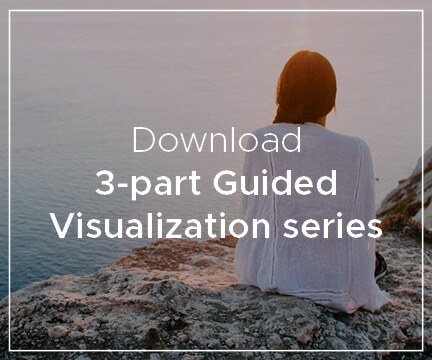 Doing this will show you the gaps between your current and ideal life, so you can draw a map to where you want go. Manifest your dreams into reality. After you’ve identified what needs to change, and you’ve taken action to make it happen, you can release and surrender and leave room for serendipity to happen. Imagine all the declarations you made have already happened and think about them as if you’re experiencing them now. Try using, “I am…” statements to solidify your belief in yourself. This is where trust comes in and knowing that you deserve a life you love. Keep your vibrations high and let go of any resistance – you’ll attract what you put out! So what could life design mean for you? To everyone, it’s different. But for those who pursue it, it’s ultimately about being who you are, and finally claiming your dream life. No matter your situation, you have the power to change your life. Once you’ve decided how you’ll start designing your life, I’d love to hear how this was for you. What’s ONE thing you will do today to start designing your life? If you know someone who could benefit from designing their life, share this post. P.S. If you want to discover your values, so you can live with clear intention, book a FREE alignment call with me. 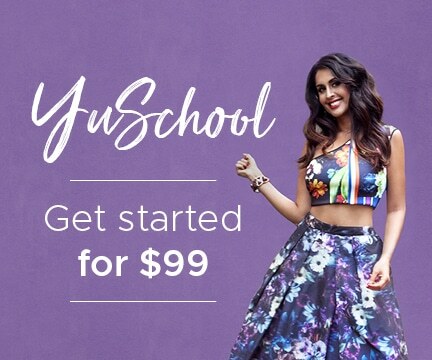 I offer no pressure, 30 minutes calls and I have a few spots left!